An innovative report writing business software add-on to popular Microsoft Office software like Microsoft Excel and Microsoft Access. Plus now our new 2004 version reports on ACT! data. 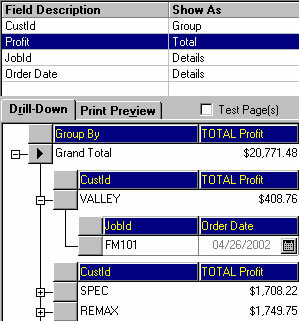 Drill-Down Tally was created to help everyday and non-technical users create ad-hoc reports quickly and easily without the need or help of your IT department. It's a reporting tool that easily integrates with virtually any open formatted data source including csv and txt text files. At your fingertips you control your own destiny with business software that easily generates a range of unlimited reports that are as summarized or as detailed as you like.